The Ford Mustang is arguably the most recognizable car on American roadways. The 2015 model year marks the pony car’s fiftieth anniversary, and Ford is celebrating by offering an all-new ride, style, and performance in its sixth generation Mustang. The American-built muscle car made it’s debut at the United States Grand Prix in Watkins Glen, New York, and has been impressing car enthusiasts ever since. The Ford Mustang is not only the original pony car, it is also the only car in its class to be in an uninterrupted production over five decades. No other muscle car has been able to keep up with the Ford Mustang in the past, and with the updates for 2015, no other car will come close in the future. Packed with more power than previous model years, and an all-new engine option, the Ford Mustang is surprisingly more fuel efficient for 2015. Regardless of budget, drivers will have options to afford the 2015 Ford Mustang, thanks to the eight different trim levels. Starting from the low twenties, and topping out at the low forty-thousand dollar price range, there is a Mustang for every driver and budget. It’s no secret that the Ford Mustang has always been a powerhouse of a pony car. The 2015 model year is no different. The upcoming Shelby GT350 is a force to be reckoned with, and the optional 2.3-liter EcoBoost engine will put performance in first place on all other models. Not only is this new powertrain option one of the more fuel efficient engine choices, it is also one of the most powerful. Better efficiency does not mean less power with the brand-new EcoBoost 2.3-liter engine. In fact, it means quite the opposite. Delivering a staggering 310 horsepower, and 320 lb.-ft. of torque, the EcoBoost 2.3-liter does anything but disappoint drivers looking for a top performance engine under the hood of their Mustang. If that isn’t impressive enough, the same engine gets an estimated 21 miles per gallon in the city, and 32 on the highway - for a combined fuel economy of 25 miles per gallon. 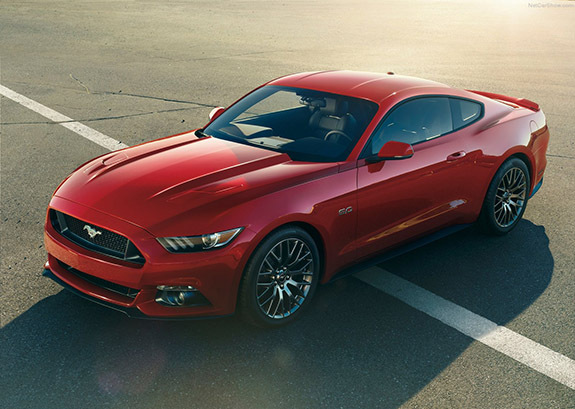 Power no longer means more stops at the pump, with the 2015 Ford Mustang equipped with the EcoBoost 2.3-liter engine. A lot of engineering and planning went into designing the upcoming Shelby GT350. Designers at Ford worked to combine power, performance, and luxury all under one roof. They succeeded, equipping the all-new Shelby GT350 with more features than ever before. Under the hood of the GT350 sits a 5.2-liter V8 engine that produces over 500 horsepower, and 400 lb.-ft. of torque. Thanks to the world-class TREMEC 3160 6-speed transmission, this Shelby does not mess around. For a more dynamic performance-fueled driving experience, the GT350 is equipped with a MagneRide damping system that adjusts itself thousands of time per second. Built on top of the all-new lightweight chassis and Michelin Pilot Super Sport Tires, the GT350 will be able to keep up at top speeds, without missing a beat. Just as important as going, engineers worked to create the perfect braking system to stop the Shelby at a moment’s notice. Front and rear Brembo cross-drilled two-piece brake rotors are engineered for performance. 15.5-inch rotors up front, and 14.8-inch rotors in back, are substantial in size to help the GT350 stop when drivers need it to. Thanks to engineered components such as wider aluminum front fenders, and a lightweight aluminum hood, the GT350 has the perfect aerodynamics built right in. Front and rear fascias, splitter, rear valance with integrated diffuser, and rocks all work together to keep the GT350 performing at peak capacity. The Mustang GT350 is the perfect example of the evolution of Ford’s engineering process. This specifically-engineered machine provides a world-class driving experience, unmatched by any of the competition. Owning the most iconic sports car in America isn’t as far-fetched of a dream as it used to be. In fact, drivers can get behind the wheel of a brand new 2015 Mustang for under $24,000. That number is impressive, and entirely reachable for those looking to reach their goals. On the other hand, those looking for top-of-the-line performance in every possible way, can choose the GT Premium Convertible model of the 2015 Mustang, for under $42,000. Featuring a 3.7-liter V6 engine with a 6-speed manual transmission. Independent rear suspension, EPAS, vented 4-wheel disc brakes, AdvanceTrac with Electronic Stability Control, and 12.5-inch front and rear brake rotors, all come standard. Auto dimming rearview mirror, manual climate control, cabin air filter, center console with armrest, locking glove box, chrome accented instrument cluster, leather-wrapped parking brake handle, leather wrapped steering wheel, push-button start, power windows, MyKey, and interior trunk release all come standard. Automatic headlamps with wiper activation, dual bright exhaust with slashed cut tips, HID headlamps, LED taillamps, rear-window defroster, and decklid spoiler delete all come standard. 6-speaker system, audio input jack, SYNC hands-free system, and two-smart charging USB ports all come standard. Rear-view camera, dual front airbags, front-seat side impact airbags, safety canopy side-curtain airbags, driver’s knee airbag, active glove box, and personal safety system all come standard. 5.0-liter Ti-VCT V8 engine with 6-speed manual transmission, independent rear suspension, selectable drive modes, and electronic line-lock. Dual-zone automatic temperature control, aluminum foot pedals, ambient lighting, premium door trim, universal garage door opener, leather trimmed seating, 6-way power driver’s seat with power lumbar control, 6-way front passenger seat, heated and ventilated front seats, 4-way front head restraints all come standard. Dual bright exhaust with rolled polished tips, heated mirrors, pony projection lights, blade decklid spoiler, and rear diffuser all come as standard equipment. 9-speaker sound system with amplifier, SYNC with MyFord Touch, SiriusXM Satellite Radio, and HD radio all come standard. LATCH system, 3-point safety belt restraint system for all seating positions, Belt-Minder front safety belt reminder, and SOS Post-Crash Alert System come standard. Regardless of which 2015 Mustang you drive off the lot in, each model offers great standard features and available equipment, with the signature power and performance Mustang drivers have come to expect.